Writing on the topic that revolves around blogging interests me a lot. Might sound quite strange but while listing down the tips and tricks related to successful blogging, I too learn and try to follow the same; believe me it helps a great deal. We have been continuously updating y’all with the blogging tips that we hope have helped you put your best foot forward in such a way that you can expect yourself to leave a mark and become a source of inspiration for the newbie bloggers. Frankly speaking, I actually have to do a great deal of brainstorming for coming up the inspiring idea for my each blog post. At times its like easy to generate the idea which I think the readers would love reading about but then there are times when it takes hours for me to come up with one. I well know what are the issues when the idea just doesn’t click and it becomes a time-consuming task so much so that the overall schedule is disturbed. Is it just me or many out there who face the same problem while planning to come up with the next blog post? Are you the one nodding your head in consent that you too face the similar situation? If your answer is yes, then I suggest don’t just stop scrolling, read on; the tips listed below would actually help you. Listed below are certain tips that I have jotted down in the anticipation to help you come up with the inspiring topics to write on. It’s not about just one thing that you need to concentrate on. From the inspiring idea to headers and quality content; everything needs to have that ‘wow’ factor that helps you become a successful blogger. You can check out the effective ways of becoming a successful writer incase you missed. For now scroll down and read the ways to do the brainstorming for generating inspiring topic ideas for your blog. The one thing I would suggest here would be reading the blogs that are of same niche as yours. Keep yourself updated with what’s latest, what other blogs are writing. Reading other blogs of same niche does help a great deal. Let me reveal a secret, I don’t take hours to write down and finally publish the article. I actually enjoy writing so takes less time. But when it comes to thinking of an idea, I actually go nuts and fail to understand what I should go about writing on. I genuinely feel we should spare some time out specifically for doing the brainstorming as to what should be the topic for our next article. I might sound insane on the very first go when I say choice of place does matter in doing the brainstorming. But all those who have read or have the slightest idea of human psychology would agree with me that our sub-conscious gets used to certain things. Like if we have a specific place, we could actually think of some really great ideas. When the human sub-conscious gets used to a place specific for brainstorming, it will automatically do what it’s supposed to. Becoming familiar to the situation, things and that particular place chosen for brainstorming helps you come up with great ideas. Make sure the place (your worktable, bedroom, office seat or any other place) has no distractions. You can at any point of your blogging career go back and check out the articles already published by you. Reading them would help you come up with the idea for the new article. You never know if you plan writing elaborately about something that was included by you in your articles previously. When I go back and read my previously published articles, it helps me for that fact that I come to know about certain things that could have been included in the article which helps me improve my writing skills too besides generation of inspiring topic for my next article. There are many people that have the habit of scribbling down. If you think they are insane then you are highly mistaken. Carrying a notepad and a pen and scribbling down the ideas that come in your mind can really help. Keep a notebook with you and scribble down notes, you never know when an inspiring idea might hit you. Pen it down before you forget. Try it out, I bet you would be amazed to see the results. It’s not a lame excuse for brainstorming but I actually feel it does work. I mean, with a hot cuppa coffee in my hand and taking the sips in a relaxing way helps me come up with the ideas in-fact lot many of them and then I go about finalizing one. If you’re the one who loves coffee, I’m sure you would agree with me on this! Even if you don’t get much of ideas, a cup of coffee would help increase your energy level. Try it out; you never know it can work for you. While reading the already published blog posts, I came across one write-up that read 10 Tips To Help You Stay Focused While Blogging. Staying focused is essential for any task we undertake. 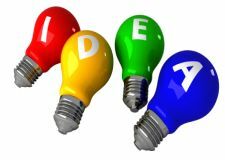 Taking the case of brainstorming, one should be focused enough to generate an inspiring idea. While brainstorming for the next post idea, let you mind wander and let it go anywhere it wants to. Trust me on this, you will be surprised where free thinking can take you and the ideas it can throw up. Here, the note pad and a pen will help you, you can simply pen down the ideas that come to your mind. While you’re brainstorming, don’t try too hard to hold on and think about the ideas. I have seen many people trying hard to come up with ideas ending up without a single one. While writing, many a times we feel the writer’s block and while brainstorming we feel the mind blockages because we don’t let things go instead try hard to hold on and work on them. This actually doesn’t work. Music! You can brainstorm while enjoying the soothing music. Ask me and I would say, music does wonders be it when you’re writing or while brainstorming (I’m listening to my favorite tunes even now). Surely, you all bookmark the interesting sites and many more that you feel are worth checking out on the regular basis. While brainstorming for your next article idea, you can browse your bookmarks. When you’re done with your article and plan to brainstorm for the next one, I would suggest you to take a break and then start over. This would be a refreshing break that would help you brainstorm in the right direction with the right output. Last but not the least, you should be committed enough to spare some time out to brainstorm and generate inspiring ideas. Some people have the habit of doing things at the eleventh hour. This attitude is wrong not only for your blogging career but in life too. (I’m actually working on this aspect and trying to be committed and breaking the habit of doing the tasks at the eleventh hour). Be committed that you have to take some time out and think of the ideas for your articles. Brainstorm as much you can. Be genuine to yourself, the ideas generated by you can do wonders. Hopefully you got some new ideas; whenever you feel that you are running out of topics just follow the tips stated above. Thinking out of the box and giving twists to the ideas that you come up with can lead to a really good write-up. So now you know the answer of the question “Where do you find the ideas for your posts?” I’m sure yes!